This is a very well built rugged trunk built for travel, just beautiful! Since the outside was originally covered in a very tough burlap canvas weave, it was very well protected during its many years of travel. The built- in wide metal straps add to its overall stability. The large #4 hasp have an etched Pat. date of May 21 1878. The brass lock is etched Corbin Cabinet Lock Co New Britain Conn. The lock works great and comes with a key. Upper portion of the lock has a Pat. Date of Dec 1 1885 and June 28 1887. It has a built-in lift, which is helpful when opening the trunk. The contoured flat corner hardware is in great condition. The front top and bottom edges are protected with hardware along with the rear hinges that roll over the rear top edge. Leather handles are original, along with the rugged handle hardware. The top has a slight curve, offering a nice display surface. Outside finish is protected with satin polyurethane and then waxed and hand rubbed for added softness. Offers a great storage area. The inside is finished with satin polyurethane so it's ready to use. Inside rivets are a sign of a quality built trunk. 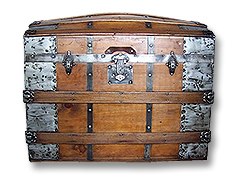 The trunk measures 28 inches wide, 18.5 inches front to back, and 23 inches tall (measurements include hardware). Price includes insurance, packaging, and shipping to any of the 48 contiguous states. If you are west of the Mississippi please add $50 to the price.